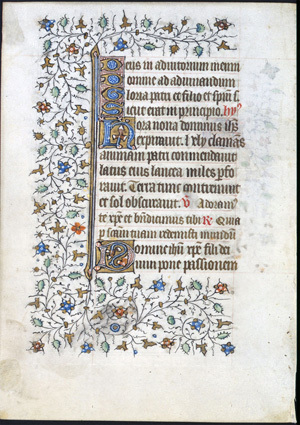 Text: This leaf contains text from the Hours of the Cross at Nones. A scan of the recto is not currently available. Reconstruction Note! In Ege's original manuscript, this leaf was followed by what is now Leaf 30 in the Ohio State University portfolio. Sicut erat in principio. Hymnus. Hora nona Dominus Iesus expiravit: Eli clamans spiritum patri commendavit: Latus eius lancea miles perforavit. Terra tunc contremuit, et sol obscuravit. V: Adoramus te Christe, et benedicimus tibi. R: Quia per sanctam crucem tuam redemisti mundum. Glory be to the Father. Hymn. Jesus Lord at the ninth hour his spirit forth did send: Crying Eli and his soul to father did commend: With a lance a soldier did pierce through his tender side: The earth then trembled and the sun his shining light did hide. V: We adore thee O Christ, and we bless thee. R: For that by thy holy Cross thou hast redeemed the world.